I have dry skin and I keep looking for products that moisturise my skin well. Be it any time of the year, my skin tends to stay dry no matter what. Also, being in the early 30s I need to take care of the anti-aging routine as well. I make sure that I don’t skip my night time skincare routine and include products that repair and nourish my skin overnight. I was previously using The Body Shop Vitamin E Overnight Serum-in-oil and loved using a lot. Using a serum that is formulated specially to use during the night really makes a difference to my skin. I was looking for a similar product and got my hands on the Dot & Key Skin Essentials Night Serum. I have been using it for a month now and will share my views on what I feel I feel about it. Caring for your face at the end of the day is just as important as caring for it in the morning. Dot & Key Skin Essentials Night Serum has a three-pronged action that moisturizes intensely, lightens your complexion and prevents ageing. Enriched with essential oils and active elements, this night serum penetrates skin deeply to offer rich nourishment and replenish its natural nutrient quotient. Its antioxidants and anti ageing properties prevent free-radical damage, while its natural skin moisture binders and tripeptides reduce the appearance of wrinkles and fine lines on continuous usage. It is carefully formulated with a skin lightening botanical system containing Uva ursi (bearberry) leaf and Paeonia suffruticosa (peony) root, which deter the production of melanin to reveal lighter glowing skin. It contains no nasty chemicals, and is completely safe and gentle on skin. Make this face serum a part of your beauty routine every night, and wake up to a healthy, youthful glow for years to come. 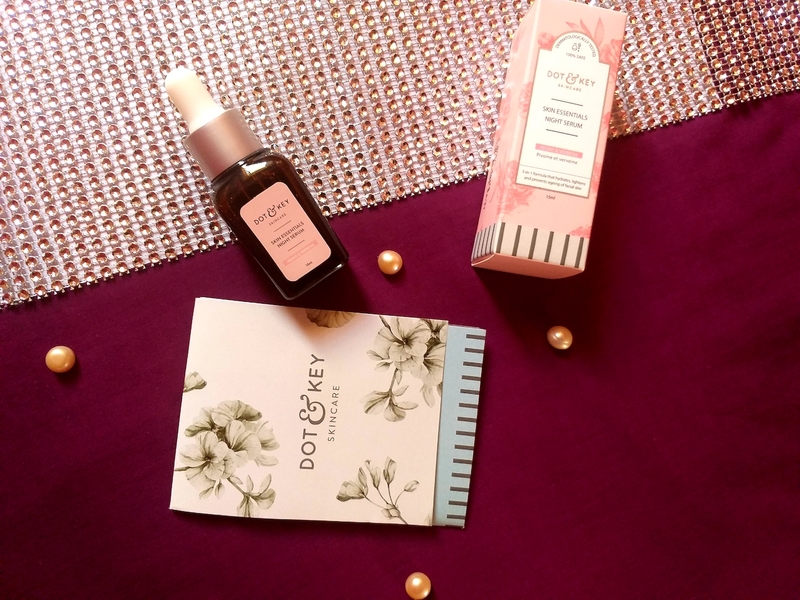 Dot & Key Skin Essentials Night Serum comes in a cardboard box that has some details about the product mentioned on it. It comes in a small glass bottle with a dropper cap which makes it to control the flow and amount of product I want to use. Since it is a glass bottle, I have to be a little extra careful when I use it. But I honestly don’t mind it that much. I don’t prefer a strong smelling serum, or any skincare product in general since it bothers me. 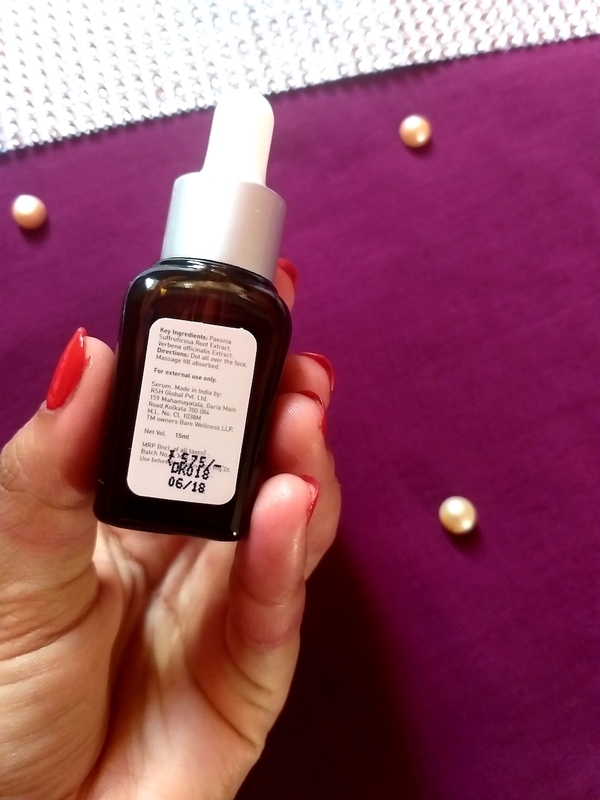 This serum has a mild jasmine fragrance and is soothing. However, it doesn’t last for a long time and fades away once the serum is absorbed into my skin, but that is fine. Initially I thought that the serum would be thick and would take some time to get absorbed into the skin. But it is very runny and to my surprise, it gets absorbed into my skin so fast! I don’t have to work much for it to get absorbed. Dot & Key Skin Essentials Night Serum just penetrates into the skin easily and doesn’t feel sticky at all. It is very lightweight and perhaps that’s why it gets absorbed so fast. My skin feels so soft and glowing after I apply it and I honestly don’t even feel like I have it on my face. I don’t even to massage my skin for a long time since it just disappears quickly. I just take a few drops and spread it all across my face and then gently pat the serum into my skin. Patting the serum into the skin actually helps it to gets absorb faster than just massaging it. Also, it improves blood circulation and benefits skin. The Dot & Key Skin Essentials Night Serum costs for ₹575 for 15 ml of the product. It is quite cost effective since I need just 5-6 drops for my entire face. I feel it would last a good 3 months. So, the serum claims to lighten, hydrate and prevent aging effects on the skin. It definitely provides my skin with enough hydration while I sleep because I wake up to soft, supple and hydrated skin every morning. Also, it has helped to lighten my dark spots and acne scars to an extent. Hopefully, they would be lightened by the time I finish the serum. About the anti-aging effects, I don’t see much difference but the area around my upper cheeks and eyes does feel a bit tighter. It just says it prevents aging so it’s difficult to say about reversing the aging effects. Overall, I am so happy using this serum and have been constantly using it ever since I got it. My skin feels radiant, soft, and hydrated every morning. I’ll definitely use Dot & Key Skin Essentials Night Serum completely and recommend you to try it out.